An absolute phrase contains a subject and a present or past participle but no verb. • With a present participle: His thoughts turning to important work at home, Clem picked up his fishing gear and headed home. • With a past participle: Her dream to become a movie star dashed,Lisa filled out an application for Harvard University. An adjective modifies a noun or a noun phrase, telling what kind or which. Adjectives can be single words, phrases, or clauses. See also Adjective phrase and Adjective clause. • Single word adjective: tall, expensive, interesting, renewed. • Adjective phrase: That iPad on the floor is going to get stepped on. • Adjective clause or relative clause: This is the book for biology class that cost a hundred and forty-six dollars. An adjective clause, or relative clause, is a dependent clause that, like an adjective of a single word—such as large or blue or difficult—modifies a noun or a noun phrase. Adjective clauses are underlined in the following two examples. • You should consider hiring someone who can speak French. • Mr. Franz, whom I will not do business with again, keeps leaving messages on my answering machine. See also Dependent clause and That or which? below. The adjective phrases in the following sentences modify the word or words that come before them. In the first example, a phrase modifies the man, and in the second example, a phrase modifies the woman. The adjective phrases are underlined. • You should introduce yourself to the man with the goatee. • The woman carrying the black leather shoulder purse is his wife. Adverbs modify verbs, adjectives, and other adverbs, telling where, when, how, how much, and why. Adverbs can be short, little words, like now, and phrases and clauses, like at ten o'clock and when we get married. See also Adverb phrase and Adverb clause. Like an adverb of a single word, an entire clause may also be an adverb. The underlined dependent clauses are adverb clauses. • When I walked into the room, everyone stood up and left. • The project has been scrapped because congress took away funding for it. An adverb phrase is two or more words that modify verbs, adjectives, or other adverbs. Two adverb phrases are underlined in the following sentence; the first phrase tells where, and the second tells how much. • Our flight arrived at the airport two hours late. The careless placement of an adverb in a sentence may cause ambiguity or confusion. An example is the first sentence below with the adverb only. The sentence can mean that I am the only person with two tickets, or I do not have more than two tickets. Clarity can be attained by putting only as near as possible to the word it modifies. • I only have two tickets. • I have two tickets only. • Or Only I have two tickets. An appositive is a noun or noun phrase that modifies a word or words before it. The appositive is underlined in the following example. A gerund noun phrase may also be an appositive. • Manny's math teacher, a native of Japan, is also an excellent judo coach. • I am very conscientious about getting in my exercise routine every day, swimming ten laps of our pool. Use an before a noun that begins with a vowel sound. University begins with a consonant sound, and the letter “m” begins with a vowel sound. Auxiliary verbs include modals and the auxiliaries be, do, and have. The present forms of be are am, is, are. See also Verb be below. A clause is a string of words that have both a subject and a main verb. An independent clause can stand alone and can be a simple sentence. A dependent clause has both a subject and a verb, but cannot stand alone as a sentence. A dependent clause must also have an independent clause in order to form a sentence. In the example below, the first clause is independent and the second clause with because is dependent. • We left the house early because traffic was heavy at that time of day. Add -er to most one-syllable adjectives and adverbs. When a two-syllable word ends in -y, change the y to i before adding -er. Exceptions include two syllable words ending in -ly, such as quickly and neatly, whose comparative forms are more quickly and more neatly. Use more with most adjectives and adverbs that are two or more syllables. • This video game is more realistic than that one. Complements are nouns that complement or complete the meaning of another noun. Nouns that provide additional meaning include subject complements and object complements. In the first example below, the subject complement is underlined, and in the second example, the underlined word is an object complement. • The architect was Anna. • They elected Fran president. A sentence with a dependent clause and an independent clause is a complex sentence. The dependent clause is first in the following example. • While I was repairing the air-conditioner in my car, I was listening to a political discussion on the radio. A compound sentence has two independent clauses joined by a coordinating conjunction. The conjunction is so in the following compound sentence. • I practiced every day, so I easily passed the exam. A compound-complex sentence has more than one independent clause and one or more dependent clauses. The dependent clause is first in the following example. • Although I was very tired, I took my son camping, and we both had a great time. A conditional sentence with an if-clause may express a hypothetical or contrary-to-fact situation. Conditional sentences that are contrary to fact may be present or past. The present usually employs a past form of a verb in the if-clause; the past perfect verb form is used with the past conditional. The first sentence below is an example of the present contrary-to-fact conditional, and the second sentence illustrates the past. • Present hypothetical: If I were not so busy, I would go to your poetry reading today. • Past hypothetical: I would have bought your car from you if I had had the cash. Real conditions, in contrast to the hypothetical conditions discussed above, express reality, and often take a form of the present tense. • I'll be at home all day tomorrow if it stays this cold outside. • after, although, as, because, before, even if, if, since, so that, unless, when, and others. • also, accordingly, after all, besides, consequently, conversely, finally, for example, in contrast, indeed, in fact, instead, in other words, in the mean time, moreover, subsequently, and many more. In contrast to an independent clause, a dependent clause cannot stand alone as a sentence. A dependent clause begins with a subordinating conjunction and is an incomplete idea. The following is an example of a clause that cannot stand alone, and as such it is a sentence fragment. The subordinating conjunction is after. See also Clause above, Sentence fragment below, and Commas with conjunctions in Punctuation Points. A direct object (underlined) tells whom or what about a transitive verb. • I left my key in my car. • I invited him and his wife. See also Transitive verb and Indirect object below. A gerund noun is formed from a present participle, or -ing verb form. An independent clause is a string of words with a subject and a verb. An independent clause can stand alone as a simple sentence. An indirect object tells to whom or for whom or to what or for what about a transitive verb. The indirect objects are underlined in the following examples. • The principal gave a lecture to the new students. • Lisa made a nice wood playset for the school. See also Quotation marks in Punctuation Points. An infinitive is to + verb. To go, to have, and to be are examples of infinitives. Infinitives may be nouns, adjectives, or adverbs, but they are never verbs. An intransitive verb does not take an object. Live and die in the following sentences are examples of intransitive verbs. They are followed by adverbs as prepositional phrases (underlined) in the examples, not objects. • Michael practically lives in his office. • Harry S. Truman died in 1972. Verbs whose past participles are not formed with the -ed suffix are irregular verbs. The past and past participle forms of irregular verbs usually differ in spelling or pronunciation, or both. A linking verb links a noun or a pronoun to another noun or pronoun, or to an adjective. In the first example, the verb be, the most common linking verb, connects Armando to dentist. Because be is a linking verb, dentist is not a direct object. In the second example, the linking verb feel is linked to sick. Sick is an adjective. A linking verb (underlined) cannot be modified by an adverb. • Armando is a dentist. Main verbs are transitive, intransitive, or linking verbs. Main verbs have four parts: base, past tense, past participle, and present participle. These are the forms of the irregular verb eat: eat (base), ate (past tense), eaten (past participle) eating (present participle). The present tense is formed from the base. Modals are can, could, may, might, will, would, shall, should, ought, and must. Think of be able to, have to, and need to as modals too. 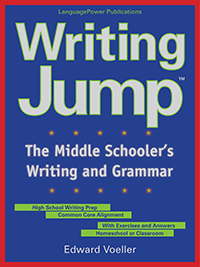 See Commas with conjunctions in Punctuation Points and nor in Commonly Confused. A noun clause can be a subject, a subject complement, or an object in a sentence. The first example below has a noun clause as a subject. In the second sentence, the noun clause is an object of the verb. In the third example, the noun clause is a subject complement. The noun clauses are underlined. • What I want is a new kitchen with all new cooking utensils. • No one can do whatever he or she wants. • This is what I bought today. See Direct object and Indirect object above. A main verb has a present participle and a past participle form. See Present Participle and Past Participle and Verb tenses and forms below. Grammarians list eight parts of speech: nouns, pronouns, verbs, adjectives, adverbs, prepositions, conjunction, and interjections. The part of speech of a word can only be accurately identified when it has a role in a sentence. A sentence must have two things: a subject and a verb. Most verbs have objects as well, and sentences often have adverbs and adjectives too. Sentences may be simple (a single independent clause), compound (two independent clauses), complex (an independent and a dependent sentence), and compound complex (more than one independent clause and one or more dependent clauses). The passive voice comprises a form of the verb be and a past participle. 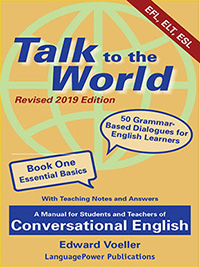 An active voice object may become the subject of a passive voice sentence, and for that reason the passive may be formed only with a transitive verb. The following two examples illustrate how the passive may be formed from the active voice. Notice that the main verb in the active becomes a past participle in the passive. The verb be determines the verb tense in a passive sentence. Active: My boss gave us a holiday today. Passive: We were given a holiday today (by my boss). In principle, all of the verb forms of the active voice may be used in the passive; however, the most common forms are listed below. See also Verb tenses and forms below. A form of be and a past participle are underlined in the following sample passive sentences. • Our garden soil is aerated twice a year, in spring and fall. • Vegetables were planted late this spring. • More flowers are being planted tomorrow. • The garden was being watered when I got home. Future or modal with will. • More weeding will be done on the weekend. Future progressive (continuous) may be formed in the passive, but it is awkward and infrequently used except when it is accompanied by an adverb clause with when. • The garden will be being weeded when we get home. • Two articles have been written about our garden for a local website. Present and past perfect progressive (continuous) are awkward and virtually obsolete in the passive voice in contemporary English. The present perfect passive may be substituted for the present perfect progressive passive, and the past perfect passive substituted for its progressive form. •The neighborhood interest in our garden had not been anticipated. • His experiment will have been tested for the nineteenth time in January. • Everything can be finished by noon. • We should have been informed about the coming storm before now. The past participle is used to form the present and past perfect as well as the passive voice. A past participle may also be an adjective, or the leading element in a past participial phrase. The uses of past participles are illustrated below. • Present perfect: My company has overworked us recently because of the urgency of several projects. • Past perfect: My boss had promised us an easy day today. • Past participial phrase: Overworked from entering data, I fell asleep at my computer. • Passive voice: We have all been overworked in order to get our projects completed by an unrealistic deadline. See also Dangling participial phrases in Commonly Confused, and Main verbs above. 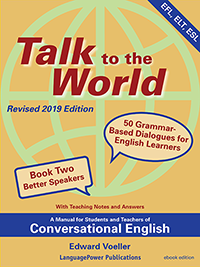 The perfect forms, comprising the present perfect, modals with the present perfect, and the past perfect are formed with the verb have and a past participle. Use have or has with the present perfect and had with the past perfect. • Present perfect: We have rarely experienced such beautiful weather. • Present perfect with modal: All of us should have eaten breakfast. • Past perfect: Until we moved here, we had never seen such beautiful night skies. See also Main verbs above and Verb tenses and forms below. A phrase is two or more words that go together and that do not have both a subject and a verb. Examples are prepositional phrases, adverb phrases, gerund phrases, infinitive phrases, adjective phrases, participial phrases, and noun phrases. See also Prepositional phrase below. 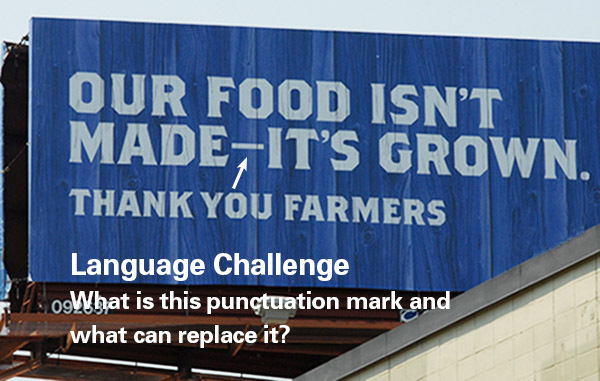 See Apostrophes in Punctuation Points. A preposition is a word that establishes a connection or relationship between two words. Some prepositions are of, at, in, out, on, before, from, with, into, because of, except for, and sometimes but. A preposition is the first word of a prepositional phrase, which comprises two or more words that go together and that does not have both a subject and a verb. When a prepositional phrases modifies a verb, it is an adverb phrase; when it modifies a noun or noun phrase, a prepositional phrase is an adjective phrase. In the first example below, the prepositional phrase (underlined) is an adverb phrase. In the second example, the prepositional phrase (underlined) is an adjective phrase. • The car is parked at the corner. • The owner of the car with the flat tire has to pay to have the car towed. An -ing word is a present participle. The present participle may be an adjective, a noun, part of a verb, or a participial in a phrase. A present participial phrase needs to modify the subject of a main clause. In the first example, it does not: the subject of the clause, I, did not die in the middle of the street. The second example is correct. • Dying in the middle of the intersection, I found it impossible to get my car started again. • Dying in the middle of an intersection, the car was impossible to start again. See Dangling participial phrases in Commonly Confused. See That or which? below. • I really look forward to our trip, I only hope the nice weather holds up. • I really look forward to our trip I only hope the nice weather holds up. The following sentence may appear to be a run-on, but it is not: the comma does not join two independent clauses. A long phrase follows the comma. • I just met Miguel, a man with an unbelievably great flock of silver hair and thick eyebrows to match. A sentence fragment is a piece of a sentence, an incomplete sentence. A fragment is often a phrase, but a fragment can also be a dependent clause that is punctuated as a sentence without an independent clause. The following are sentence fragments. • In spite of all the effort. • While we were waiting for you. • If you think so. The subjunctive forms of verbs are used to express the hypothetical or the contrary to fact. For example, the verb wish requires a subjunctive verb in a noun clause because a wish expresses what is hypothetical. Were in the following sentence is the present subjunctive form of the verb be. • I wish that I were two centimeters taller. The reality is that I cannot be two centimeters taller. Certain verbs, including demand, advise, insist, and require, introduce noun clauses with verbs in the subjunctive. Notice the third person singular verb form (underlined) in the following sentence. The subjunctive form does not require an -s suffix. • Sarah insisted that she leave ten minutes early. Hypothetical conditions with if-clauses also involve the subjunctive. See also Conditional sentences above. In general, use -est at the end of an adjective and an adverb to form the superlative of a single-syllable word: soft—softest, pale—palest. • Lyna is probably the brightest of all the students in my class. • She also works the hardest. See Verb tenses and forms. See Verb tense shift in Commonly Confused. Use the pronoun that with an essential or restrictive adjective clause. • This is the book that I bought for my teacher. Use what to introduce some noun clauses. • He told me what I expected to hear. See also Noun clause above. • This is the dead indoor tree that cost me two day's salary. • The indoor tree, which lived only one week, cost me two day's salary. If which is preceded by a preposition, it may be used with essential clauses. • That is the high school from which I graduated in 1998. See Comma with nonessential (nonrestrictive) clauses in Punctuation Point. A transitive verb requires an object. Most verbs in English are transitive. Help and want are transitive verbs in the following sentences. The objects are underlined. • The entire class helped our teacher. • Everyone wants more free time. 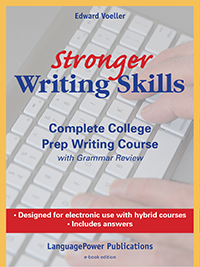 Four verb forms may function like nouns, adjectives, or adverbs: infinitives, present participles, past participles, and gerunds, which are present participles used as nouns. Caution: verbals can easily be confused with verbs, but they do not function as verbs. Unlike other verbs, whose present tense requires only an -s on the base to form the third person singular, the verb be has three irregular present tense forms: am, is, and are. The following are the verb tenses and verb forms in the active voice. • Priscah Jeptoo runs fast. • She finished second in the Olympics. • She is training now for the London Marathon. • Priscah was explaining her training program on a TV talk show this morning. • She will continue to improve. • Priscah will be traveling over the weekend. • Half-marathons have become increasingly popular in recent years. • Sports media have been giving marathons more coverage. • Phil Coppess had not expected to win. • He had been hoping to beat his own time. • When he reaches the goal, the runner from Panama will have completed six marathons this year. In addition to the future perfect with will, these modals may be used with the present perfect: should, could, may, might, must. • We all should have stayed in Hawaii longer.